Editor's note: This story has been updated with responses from Houston officials. If the state taps into the Rainy Day Fund to help with recovery following Hurricane Harvey, it won't be until the next legislative session, Gov. Greg Abbott said during a news conference Tuesday. Abbott's announcement comes after Houston Mayor Sylvester Turner wrote to the governor asking the state to use the $10 billion fund. Turner said without significant state help, Houston will be forced to raise property taxes for one year to bring in $50 million for recovery efforts, which would cost the owner of an average Houston house $48. Turner said he would not have proposed the tax hike had the governor called a special session to tap into the fund. Abbott, who has said the state has enough resources to address Harvey-related needs between now and the next legislative session, added Tuesday that the state has already granted Houston almost $100 million for debris removal and established an "accelerated reimbursement program" for recovery efforts. Turner "has all the money that he needs," Abbott said. "He just needs to tap into it," referring to money in Tax Increment Reinvestment Zones. In an emailed statement Tuesday, Turner spokesman Alan Bernstein said Houston "cannot raid funds that the state has indicated cannot be raided – and which are largely for drainage projects to prevent future flooding anyway." Damages from Harvey have exceeded Houston's $100 million flood insurance limit, according to Turner's letter to Abbott, and now the city is going without flood insurance in the middle of hurricane season. Turner's letter said financing from the Rainy Day Fund would have been able to cover the estimated $10 million cost of extending the city's $100 million flood insurance policy until April 1, 2018. "In times like these, it's important to have fiscal responsibility as opposed to financial panic," Abbott said. He later added that "the mayor seems to be using [Harvey recovery] as hostage to raise taxes." "Mayor Turner is asking the governor to do what other governors, such as Florida’s, are doing," Bernstein added. "It’s the Texas governor’s right to say no." 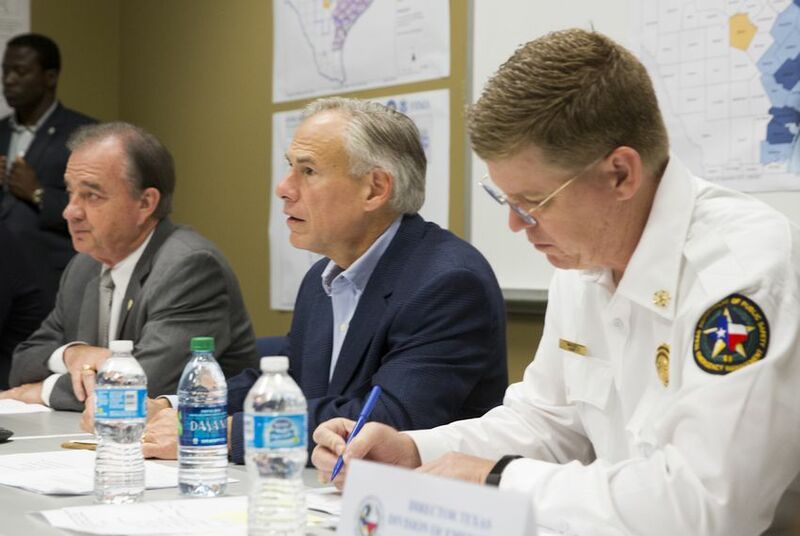 On Tuesday evening, Abbott spokesman John Wittman said Florida is getting a 75/25 split with FEMA after Irma — meaning the federal government is picking up 75 percent of the recovery tab, while 25 percent is up to local governments. By comparison, Abbott negotiated a 90/10 split following Harvey, Wittman said. At the news conference, Abbott also reaffirmed his support for Senate Bill 4, legislation aimed at outlawing "sanctuary cities." "During the initial phase, the focus was on saving lives," Abbott said. "As we get back into the normal course of daily activities, it's gonna be important for all people who live in this country to follow the law."